Successfully Added Professional Metal Detector ''Gold Finder 2 '' - 3.8 Inch LCD Screen, Sensitivity Adjustment, 40h Battery Life, Earphone Jack to your Shopping Cart. Head out into the unknown and engage on your own treasure hunt with this state of the art metal detector. Being able to detect and locate a wide range of metals, this waterproof metal detector will help you on your quest to find hidden treasures that may have been lost for centuries. Whether you’re digging for ancient artifacts, war relics from the Second World War, or for more recent lost treasures such as golden rings and necklaces – with this professional metal detector at your disposal your options will be limitless. Coming with a beautiful back-lid 3.8-Inch LCD display, this precious metal detector provides you with all the information needed to take the most out of your upcoming treasure hunt at both day and night. Its simple to operate interface allows you to easily select the metal type you are digging for and furthermore allows you adjust its sensitivity, ensuring that you’ll always find that what you’re searching for. Additionally, its display also informs you about your current battery level, ensuring that you’ll never run out of juice while in the middle of a dig. With its epic battery, this is, however, not an issue to worry about in the first place as this magnificent metal detector allows you to hunt for gold, silver, copper, and more for 40 hours continuously. Weighing just 1.6kg and coming with a comfortable padding grip and elbow rest, it’s easy to carry along and operate this metal detector for numerous hours in a row. Whether you’re out on a short trip in a nearby meadow or are engaging on a week long treasure hunting trip far out in the wilderness away from society, this metal detector will be there to comfortably help you on your search for the next valuable object. 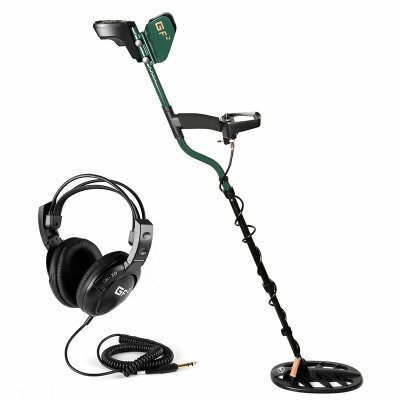 This magnificent machine furthermore supports an earphone jack and comes with its own 1/4-Inch stereo headset – allowing you fully concentrate on the readings of your metal detector without being distracted by outside noises. Its voice volume can be easily adjusted through its LCD display ensuring that, no matter the environment, you’ll always be able to hear when your device has found a potential treasure beneath. Featuring a partially waterproof design, this magnificent treasure hunting tool can not only be used on the surface but also for searching for lost coins, rings, and other artifacts in a shallow creek, river, and shoreline – allowing you to find precious metals and objects that have been hidden for centuries beneath the water levels. With an operating temperature ranging in between -20C and +50C, this metal detector is capable of operating perfectly in any imaginable environment out there. Whether you’re hunting for gold in the desert, lost artifacts in the icy North, or hidden coins and arrowheads in the UK – this magnificent device will follow you wherever you go. Being simple to use and capable of detecting all types of metallic objects located meter’s below the soil, this underground metal detector is the perfect trick to help seasoned professionals and beginners alike to strike the mother lode. Arabic - للكشف عن المعادن; Chinese Simplified - 金属探测器; Czech - detektor kovů; Danish - metaldetektor; Dutch - metaal detector; French - détecteur de métaux; German - Metall-Detektor; Greek - ανιχνευτής μετάλλων; Hebrew - גלאי מתכות; Hindi - धातु वेक्षक; Hungarian - fém detektor; Italian - metal detector; Japanese - 金属探知機; Korean - 금속 탐지기; Norwegian - metalldetektor; Polish - wykrywacz metali; Portuguese - detector de metais; Russian - детектор металла; Spanish - detector de metales; Thai - เครื่องตรวจจับโลหะ.